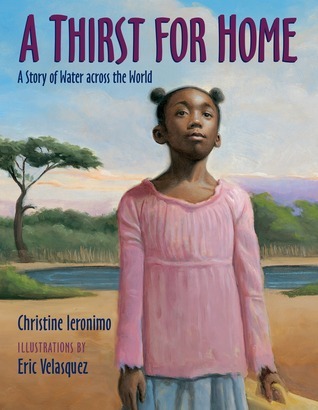 Realistic FictionA Thirst for Home A story of Water across the WorldBy Christine Leronimo. Illustrations by Eric VelazquezRecommended Reading LevelMinimum Age: 04Maximum Age: 08Minimum Grade Level: PMaximum Grade Level: 03aThis text is chosen as one of my books for my Resilency text set for class. I have chosen it because it shows a strong female character who has to over come hardships in her country or origin as well as adapting to a new culture once adopted by her family in the U.S. This realistic fiction story take place in Ethiopia and then possibly in the United States. It is a story about a young girl and her struggle to find water with her Mother. In the end of the story she is given up for adoption because the mother wants a better life and safety for her child. This story is a good representation for Realistic Fiction because it deals with the real 3rd world problem of finding clean safe water to drink and the struggles people in the areas having finding food and water. The story addressed adoption and the hard choices some parents make to give their children a better life. This story also addressed the different ways a child assimilates into a new environment. The main character is a good representation of the need to remember to your past and adapt to a new home life and culture.Many of my students have been in foster home so or are being raised by grandparents or aunties. In my school some of my students left their homes in Dominican Republic, Puerto Rico or Mexico and are still adapting to living in the United States and our culture here.Some things to consider and teach my students are about the luxury of clean safe water that we have in developed countries. My students do not understand the financial and educational and financial hardship this creates for students, especially girls. In this story we could look at concrete and inferenced information and use our schema about what we know about families, water and coming to a new country. We could analyze characters traits by their thoughts and feelings with a chart. We could brainstorm ways to help characters liked Emaye who have not water in their village. We could do a school fundraiser with waterproject.org that has free kits to help fun water projects in towns and villages. I think this would be a wonderful way to do something concrete to help the children synthesize and create something at the end of the lessons that is meaningful. It would help them become activist and allies to others in the more meaningful to them.Questions and promptsWho is telling the story? What story does Emaye tell Alemitu when they are walking to the watering hole? Why is water important to Emaye? What does it mean when the fierce lion roars in Alemitu’s belly? (Inference) Why does Emaye leave Alemitu with the nannies? (Inference)In her new home in America, what is Alemitu’s new name? Why does Eva want to show Emaye the water from the faucet? Why does Eva eat the crust of her sandwich? (Inference)What colors is the butterfly? Why do you think Eric Velasquez choose these colors?What does Eva see in the puddle and why does this make her happy? How does water connect everyone in the world? DISCUSSION PROMPT: Imagine you were to look down into a big sparkling puddle, describe what you would see? Teachers, children can illustrate what they see in their puddle. DISCUSSION: Compare the illustrations of Eva’s home in Ethiopia to her home in America.Difficult VocabularyWatering hole, beneath, bundles, precious, nanny. fierce, weightless, connected. Alemitu, whose name means world, lives with her mother in a poor village in Ethiopia, where she must walk miles for water as hunger roars in her belly. Even though life is difficult, she dreams of someday knowing more about the world. When the situation becomes too desperate, Alemitu's mother takes her to an orphanage hoping that her daughter can have a better life. Soon, an American family adopts Alemitu. In America she becomes Eva, where she has two brothers, a sister, a dad, and a new mom. Although in some ways her life is better, she cannot forget her homeland and the mother who gave up so much for her.I wasn't originally going to post something today. However, this book showed up in book club yesterday and then I found out that today is Birthmother's Day and tomorrow is Mother's Day. Given the material, it felt rather a poignant book to review on such a day. First off I must say how incredibly happy I am to see a book about adoption that didn't feel like one of those didactic "issue" books on the subject. As I read it, I grew even more excited as it is the story of an older child adoption, from a foreign country, who is part of a multiracial family. It is honest and sad and beautiful all in the same breath. The illustrations are perfect, breathing emotion and beauty into each page.The through-line about water was a great way to pull everything together. As Alemitu's birthmother says, "All over the world, the clouds make the rain and the rain brings us our water. This connects us to everyone and everywhere. Water is life." I was actually a little surprised by the author's note, because the subject of the story seemed to be about adoption, but the author clearly thinks that water and the lack of it is the real story here. Perhaps that is the big picture. Would Alemitu's mother have had to place her in an orphanage had they had access to regular drinking water? Would Amemitu's story have had so much loss and sadness? This story may seem a bit too melancholy, but it is so important. It is important for families like Eva Alemitu's. It is a gateway for deep discussions about birthmothers, adoption, water, multiracial families, poverty, hunger, and hope. Most important, it is about hope. This review was originally posted here at Children's Atheneum. A well-meaning story but one I find troubling for a couple of reasons. First, a mother has to give up her daughter for adoption because she cannot provide her with basic necessities. Perhaps it is a realistic scenario but couldn't the author come up with some sort of resolution that keeps the mother and daughter together? I guess I've grown tired of seeing stories where impoverished African children have to be "saved" with adoption by white westerners. This would be more palatable if the child were an orphan but she's not. Another problem I have is that once the child goes to her adoptive country she apparently has no further thoughts of the mother she left behind. That left me cold. A Thirst For Home: A Story of Water across the World is a work of realistic fiction that tells the story of Alemitu/Eva who lives in Ethiopia with her mother and ends up being adopted by an American family. The story begins with her as Alemitu, talking about her name and a little bit of her culture. She shows that her emaye (her mother) is very important to her. Soon the story changes to Alemitu saying she is being taken away from her mother because her mother can no longer care for her. She is adopted by a white American family who become her new mom and dad. They rename her and she appears happy to be with them. She seeks connection with her mother through water, which is a metaphor for the lack of distance between space and time. At the end, the author included a note about water shortages in some African countries and that she wrote the book for her daughter, whom she adopted.While this book is developmentally appropriate for grades K-5, this book is incredibly problematic. At first, the gorgeous illustrations and initial poetic feel of the book leaped out at me. It truly could've been a beautiful book about the various cultures of Ethiopia. It quickly transitioned into that Alemitu's emaye couldn't care for her. There's no real reason why. It's just something that the reader is supposed to accept. This is truly an easy narrative to accept due to it easily meshing in with the narrative of Africa being inept at caring for itself. Alemitu is adopted by a family in America and there is no reasoning why this family adopted her, a child of a vastly different culture or another race. We are also just supposed to accept this. Her name is changed, which is incredibly interesting and problematic. Alemitu is at least 7, so she knows what her real name is and identifies as that. The book being tidily wrapped up by a PSA about water problems in African countries makes it feel less like a book for children and more like a book to stimulate adults to donate to a cause. There was also no diversity in different ethnicities. The Ethiopians lacked agency and the Americans had a better life all over because they had agency. I think the problems could be attributed to the book being written by someone not of the culture (a White American woman writing about Black Ethiopian problems.) Truly, it's important to write on a topic one is an insider on. As an adoptive mother of three children from Africa, I'd personally like to give this book NO stars. It is not acceptable for western parents to spend thousands of dollars to adopt a child with living parents simply because they are poor, without access to clean water. This is an abuse. The white, rich-by-African-standards family, is essentially, taking advantage of the poor, uneducated mother. It's offensive. It's unethical. What does it take to help this child stay in her birth family? Very little by our standards. It glorifies an imbalance of power. Disgusting. I chose to give this book two stars solely based on the fact that my two youngest children enjoyed seeing a brown child adopted into a peach family. But I will never read this story to them again. A Thirst for Home by Christine Ieronimo is a beautifully illustrated children's picture book. It opens a window into the world for young readers, showing the connections we all share with each other. Through the eyes of a little girl called Alemitu, you see and feel the gift of a mother's love, and how strong the bonds of kindness hold. The story is elegantly written and the illustrations are inspired. Alemitu's journey will take you across worlds and leave you looking deeper into the well. This is definitely a book to share with your whole family. As always I love the Eric Velasquez illustrations. Although I can understand some of other readers objections to the reality of a mother having to give up their child, I felt that the sensitivity of the illustrations give the impression that the adopted child did retain both the donnection with their land and her mother. I also hope they will read the jacket flap which tells that the author does have anadopted dughter. Mixed feelings about this book. It does give great factual information about the terrible effects the lack of water creates in a community. But the illustrations rely more on stereotypical images of Ethiopia and the US, giving the heartfelt text a more general, broad strokes feel. This then detracted from the agony a woman might face during the choice of giving up her child for adoption just to keep them alive, and left the tone of the story muted. A touching introduction to the water crisis that affects many people around our world. Eva is adopted from Ethiopia into a loving American family and she recounts her struggles in Ethiopia. An authors note with additional, inspiring resources. An emotional read for both my students and me. The more we read about the inequity of access to clean water in Africa, the more empathy we have, and the more action we want to take. My students found both mothers in this true story to be incredibly brave: one for her heartbreaking sacrifice, and the other for sharing their story. This book is a spectacular light of what it is like to live in a third world country. It also depicts the differences between first world and third well, and feel many should read this book. This is a very good story about a little girl who is adopted from Ethiopia. Alemitu is a young girl growing up in Ethiopia. Alemitu loves living with her mother but unfortunately that also means tremendous hunger and poverty. To provide Alemitu a better future, her mother allows Alemitu to become adopted by an American couple. Alemitu is now Eva. This book highlights Eva’s journey through adaptation in a new environment. Eva longs for her original home and has a hard time adjusting at first. However, she realizes that her new parents love her just the same and while she may live in a new environment, she does not have to forget her true identity as an Ethiopian girl.This story has an amazing plot that highlights the concept of different cultures and adaptations. It even displays a lot of diversity! Even in the illustrations, Eva’s outerwear and appearance (as far as clothing and hairstyle) are very accurate to where she currently resides. The language and speech is appropriate and everything is just the right amount of complexity while not being overly simplified for the designed age group. Ethiopia, drought, adoption; lots to absorb here.Realistic, tender images - I especially like the image of the scarf and what it represents.I missed the lion's fierce roar as hunger until I reread the pages where it was introduced, up until then, there did not seem to be any conflict. Even thought the mother described water as more precious than gold, I think a lot of student would need guidance to pick up on that. The skinny cow may help provide a clue, but the story starts with "The sun was always smiling down on me..." gives the impression that all is well. It makes the transition to being adopted and moving to America seem without struggle. The author's note helps readers understand why her mother would give her up for adoption, which could be upsetting for some children who may get the idea their parents might give them up if life at home gets tough. Teachers reading this should be prepared to sensitively address this and be aware of students in the class who may be adopted. A Thirst For Home is a realistic fiction. A girl named Alemitu lived in a small village in Ethiopia with her mother. The water is life to humans. Alemitu walks miles with her mother to fill their water jug. She also talks about carrying heavy things on the back and walking barefooted. Because Alemitu’s family is poor, her mother decides to send Alemitu for an adoption for a better life. Alemitu was adopted by White American family and her new family cared about Alemitu and she started opening the loveable family. Alemitu talks about the new environment that she lived now. She can drink clean water without walking miles and walk to school. Many small towns in Africa suffer from having no clean water. Because they don’t have access to clean water, people suffer from diseases. There are some groups that build a water pipeline to decrease disease that children suffer from. It is very different how we all come from different environments. This is certainly a sad picture book, but also one that may inspire many to help one of the organizations that are putting wells in villages throughout the isolated villages in our world who are in need. A young girl walks with her amaye (mother) hours to the watering hole to get water, while she also mentions a lion roaring in her belly. She is thirsty and hungry, a continuing problem. Eventually, she must say goodbye to her mother and homeland. She’s been given up for adoption to an American family. With beautiful illustrations bringing this poignant story to life, and a full-circle story, Christine Ieronimo shows the terrible need for water so that young girls can stay in their homes, and spend time in school instead of walking hours for water. According to the facts given in the backmatter, only 33% of women in Ethiopia can read or write, leaving them to live in poverty, unable to provide the most basic needs of food and water. Review copy: Final copy via publisherA Thirst for Home definitely shows an example of water scarcity in the world. For young readers this could be an introduction to that issue. Young readers in the United States may be unaware that not all children around the world have access to safe drinking water or that girls may spend so much time seeking water that they cannot get to school. I was troubled though that Alemitu loses her name when she is adopted. She is not an infant. She knows her name. Why is it taken from her and replaced? Toward the end we do see her use both names, but it was puzzling to me why her name was initially erased.She does try to hold onto her memories of her home country, but things like removing her name don't seem to be helping in that effort. This would be a book that could be used to open up a unit about water issues in the world, but I wouldn't recommend it as a book for readers seeking books about adopted children. Young Alemitu grows up in Ethiopia where she often walks barefoot to the watering hole with her mother. She knows the fierce roar of a hungry belly and tired limbs from carrying wood or water. Her mother tells her goodbye one day and sends her on a new journey to a new family. Now Eva grows up carrying a backpack and wearing shoes, and is not hungry anymore. The rain helps her to remember her connection with her homeland and her mother. An author’s note at the end explains the dire straits of many children in the world who grow up hauling dirty drinking water. Web links are included with words of encouragement to learn more to help solve this problem. Another good book for 1st-3rd grades. This is the story of a young girl's journey from the plains of Ethiopia, where the lion roared, to the other side of the world, where the lion isn't fierce anymore. She discusses how things are different, but also are the same.I would ask questions about what was the roaring lion a representation of and why did her Emaye (mother) send her to this new place across the world?Ieronimo, C., & Velasquez, E. (2014). A thirst for home: a story of water across the world. New York: Bloomsbury Publishing, Inc.,. An adoption story that sheds light on the essential need for water and how people in other parts of the world struggle to have access to this basic resource.An author's note gives readers some food for thought and includes 3 websites for further discussion of the topic. This one really made me think. The author did a great job of giving readers a solid adoption story that included some hard facts, though didn't manipulate readers' feelings; the facts evoked emotions all on their own without the frame of someone else's interpretation.Mixed media and oil illustrations. PreK-2+. A powerful story with gorgeous illustrations. This multifaceted story is told in a beautiful, simple and compelling way. I would recommend this book to ALL parents and teachers to read with their children and students. There are many important issues brought up by this book including adoption, poverty, the importance of water and the need for all people to have access to clean, safe drinking water. This book on its own is a wonderful, deep story, but would also make a wonderful conservation starter to have an age-appropriate discussion with children about local and international issues. This book provided a kid-friendly way to address the problems often experienced in third world countries and adoption from these countries. Rather than coming right out and saying that Alemitu was hungry and didn't have enough to eat, it said that there was a lion roaring in her stomach. It also addressed that she went barefoot everyday while walking for miles. Finally, I liked how they incorporated Ethiopian vocabulary, such as what Alemitu's name met, emaye meant mama, and ehwatdeshahlehu, se't lidj meant I love you, daughter. This is a great addition to our empathy unit, to use in conjunction with A Long Walk to Water. Alemitu is a young Ethiopian girl who collects water with her mother daily. Once her family has no food left, her mother is forced to give up Alemitu for adoption. Alemitu is adopted by an American family and becomes Eva. She never forgets her roots, though. The story is perfect for young readers to understand the hardships so many people in the world face. Overall, an uplifting story of international adoption/consciousness raising about access to water. The backmatter, however, was very sparse, and the abrupt shift in the color palette after Alemitu's adoption gave the unfortunate impression of a white savior narrative. The latter was surely unintentional--since the story is based on the very real experiences of the families like the author's and like Alemitu/Eva's--but it felt jarring anyway. Christine Ieronimo Eric Velásquez - In 2008 I traveled to Ethiopia to adopt a little girl, my daughter. A day after our return, I found her drinking from a puddle in our driveway. That inspired me to write a children's book about water across the world. The need for clean water in Ethiopia and around the world has become my passion. It is my hope that this story, my very first book, will inspire other children to want to learn more about this global problem.